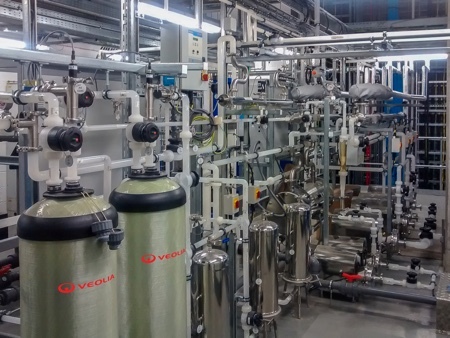 Gast Group managing director Adrian Lee looks at the specifications required for compressed air in cleanrooms and argues that the latest oil-free technology has a head start over traditional designs. The applications for pure dry compressed air in cleanroom environments range from pressurisation airlocks and the operation of automatic door opening mechanisms to data sampling equipment, analytical processes and the operation of laboratory instrumentation and robotics. Oil-free compressors are also used in medical cleanrooms, which require the highest standards of cleanliness. Applications include the hygienic sterile facilities used to prepare medical equipment for the treatment of patients receiving chemotherapy. To meet the growing demand for clean, dry compressed air in cleanroom environments, air compressors and accessories need to meet industry classifications, such as Federal Standard 209, British Standard 5295, ISO Standard 209 and the Pharmaceutical Cleanroom Classification. They must also offer a combination of low noise levels, reliability, long life and low maintenance. These standards are met by the Gast Group’s JUN-AIR range of oil-free air compressors. 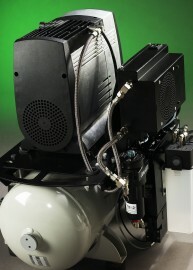 To minimise the introduction, generation and retention of particles inside the room, and to ensure that other relevant parameters such as humidity and pressure are controlled, compressors like those in the JUN-AIR range can be fitted with a wide variety of accessories to ensure that the appropriate standards are achieved. The need for pure air requires compressors to be equipped with air-intake filters, post-compression filters and dryers to minimise the risk of contamination. Where stringent levels of cleanliness are required systems can provide HEPA filtration down to 1µm and bacterial filtration to 0.01µm. As the control of humidity in cleanrooms is also becoming increasingly important in areas such as semiconductor and pharmaceutical production, dehumidi-fication units – mechanical coil or desiccant types – are also available. Mechanical coils dehumidify the air by cooling it. As cooler air holds less humidity, lowering the temperature causes water to condense out of it. However, to dehumidify a cleanroom to the fine tolerances needed for semi-conductor fabrication, for example, desiccant dehumidification is essential. The water vapour in atmospheric air condenses to water droplets when the compressed air cools. 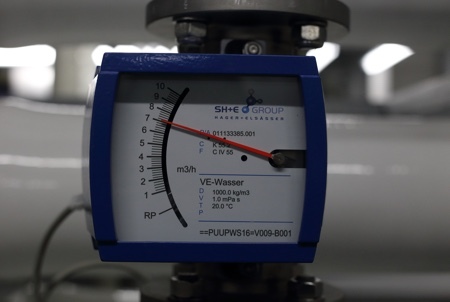 At the same time, moisture and heat from the compressor create favourable conditions for the growth of bacteria. Adsorption dryers are recommended to remove water vapour before compressed air accumulates in the receiver and can ensure a constant and absolute pressure dew point down to –40ºC. Bacteria become inactive at a pressure dew point below –23ºC and may subsequently be removed, and the risk of corrosion is eliminated at –30ºC. By removing particles, water and vapour from the air line this additional equipment ensures that the air supply is of the highest quality. Figure 21 shows a typical sample from a compressor without a dryer, where contamination in the air has provided ideal conditions for bacterial growth. In Figure 31 the sample was taken from an oil-less compressor fitted with a dryer that has eliminated the risk of bacterial growth. 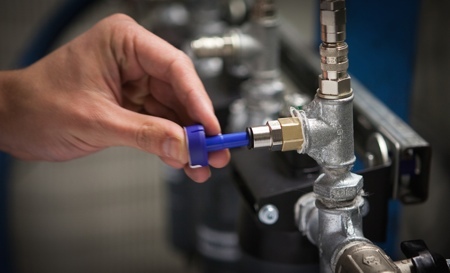 For many applications the air compressor is located in a ‘grey area’ next to the cleanroom, which allows the air supply to be piped into the working environment. For stand-alone compressors operating within the cleanroom environment, noise can be a concern. However, with decibel ratings as low as 47–55dB(A) when housed in an attractive soundproof cabinet, models in JUN-AIR’s oil-less range have the lowest noise levels available, making them ideal for installation in or near individual workstations. To ensure the highest air quality throughout the lifetime of the oil-less compressor range, receivers are internally powder-coated to avoid corrosion. Dryers are located upstream of the receiver so the receiver only stores dry air. 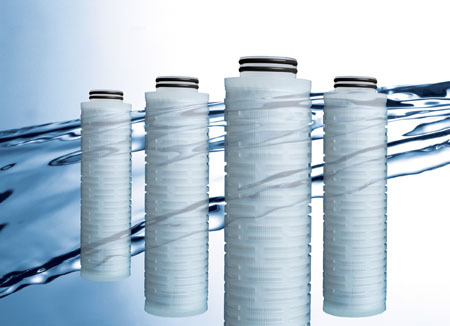 Units feature a unique cooling system and wear-resisting piston rings, and are designed for 100% continuous operation up to 10bar maximum pressure. Higher pressure units are also available. 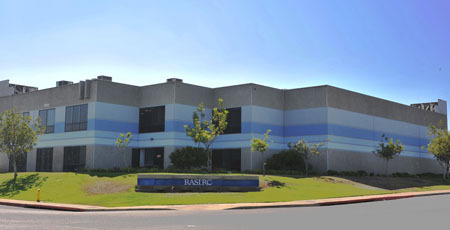 The Gast Group supplies leading instrument manufacturers worldwide with both standard and custom designed units. The range includes vacuum pumps and the OF300 series, which is also supplied as a combined air compressor/vacuum pump. DC versions are available for remote sampling. Advances in cleanroom technology have led to a demand for services such as air and water to be of the highest available quality. JUN-AIR compressors meet that demand with air quality that achieves ISO 8573.1 Quality class 1.1.1. 1. Focus on hygiene in dental compressors by Finn Djurhuus, chief adviser and head of section for DTI Industries. A copy of this article is available from the Gast Group.